In this striking design the centerpanel is worked first in a 8 row lace pattern and then the sidepanels in basic lace. This turns into a fabulous shawl - it is the most sold pattern on Hippstick.se! Choose vibrant or soft colors, in white for weddings or black for eveningwear. 4mm circular needle - knit back and forth! Suitable yarns - hemp, linen, cablespun cottonmerino. 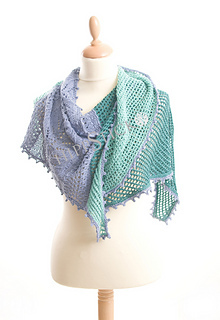 The Shawls from Mr Darcey’s Cottage is an e-book including 11 shawlpatterns by designer Julie Ferguson for Hippstick.se - a Swedish webshop specialised in beautiful yarns and patterns. All patterns have been knitted and appreciated by many, many Swedish knitters. This e-book now offers the patterns in English to English knitters! In order for you to easily find suitable yarns, the e-book also contains information about the features of the yarns used, yardage, shades and amount. Original yarns used in the designs come from Onion Knit, Karin Öberg (Kalinka Linen) and Permin (Zenta by Permin) - all yarns are specified. All patterns are translated to Swedish and sold as single patterns by Hippstick under trademark Hippstick Original and in Swedish - on Hippstick.se. For Scandinavian customers all yarns used can be bought at Hippstick.se.